Today, Ameripack, Inc., announced the addition of a new case size to its already extensive line of rotationally molded cases. The AP5918-1006WH case, 59″ long by 18″ wide and a 16″ overall depth. This new case may be one of our most innovative designs yet. A first in the industry, we have placed optional, in mold 1/4-20 nut inserts into the internal valance of this case allowing you to quickly mount whatever you need in place. Our customers have already begun to use this feature to affix straps and panels into place, but we also envision easily mounting in steel frames to hold your heavy equipment, an easy placement of mechanical fasteners to hold your custom foam interiors, or simply mounting electronics for a quick open and use configuration. The possibilities are endless and we are excited to see how our customers begin to use this feature over the next few years. This case is impervious to temperature and impact, while the molded in gasket groove allows for an airtight and watertight construction. This case can be molded in just about any color required and can feature optional, in mold labels and custom interiors to fit your parts perfectly. 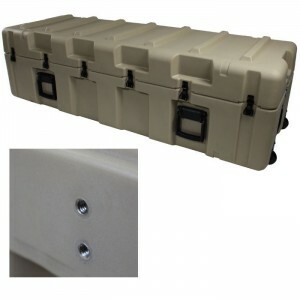 AMERIPACK manufactures a full line of stock and custom cases for every need. For the past twenty four years, AMERIPACK has been providing the highest quality cases to America’s military, manufacturing sectors and first responders. Headquartered in Robbinsville, New Jersey, AMERIPACK is a certified small business that delivers outstanding service, quality and value. Please fill out the form below to request more information, a quote or a call from our sales team. You can always call us at 1-800-456-7963!